Note: This interview was conducted as background for a feature on Casey Hardi which appears in the Davis Enterprise and Woodland Daily Democrat December 5, 2020. Photo to left is Casey Hardi in foreground and Eduardo Rojas at Della Fattoria Bakery, Petaluma. Q. You grew up in Davis, went through the Davis schools with Crunch Lunch and the Davis Farm to School Program, had the late Dorothy Peterson (co founder Davis Farm to School) as a teacher, and your mother is chair of Slow Food Yolo. What were your early influences in Davis that caused you to decide baking was your passion? A. My experience with food started when I was very young, with my mom. I always wanted to be in the kitchen with her watching what she was doing and trying to help when I could. This continued throughout my entire childhood and adolescence. I was always amazed at the process of turning raw ingredients into something delicious and beautiful. That same curiosity was carried through in school as well. I had Dorothy Peterson as my second grade teacher at Pioneer Elementary. The school garden program had just gotten underway and we spent much of the school year planting and tending to vegetables on campus. It was a very unique experience and I think it opened my mind as to what food really is and can be to an individual. My mom had always kept a garden as well and the experience in school, combined with the experience at home, fostered a great interest in food and a need to understand and create with it as a medium. It wasn’t until I was fourteen or fifteen that I decided I wanted to bake, but I believe I decided on it because I didn’t understand it very well at the time but was amazed by the final products of the craft. I always enjoyed science in school and baking was a way for me to combine two things [food and science] that I loved. Q. When did you know, and how did you know that bread baking in particular was the type of baking you wanted to specialize in? Were there early mentors for you in Davis? A. I did not decide on bread baking right away. Pastry is where I began; working under Master Pastry Chef Albert Kutternig at Konditorei in Davis. When I was fifteen I was thinking about culinary schools and wanted professional insight, and through a friend of my mom, I was able to set up an interview with Albert. When I asked him about schools, he told me that I could go to a school like Hyde Park in New York, or the CIA in Napa, but if I wanted to own my own shop at some point, I should go to college for a business degree and work under him at Konditorei in order to learn. So that’s what I did. I began working for Albert when I was still in high school, and when I graduated, I started taking classes at Sacramento City College right away. Around the same time that I graduated, Dorothy contacted me about a project she had in the works called Artisan Baking on Wheels (ABOW). She asked if I would be interested in working with a wood fired oven at the Farmers’ Market in Davis, an opportunity I jumped at readily. In the weeks of preparation leading up to the oven’s debut at the market, she sent me to a weeklong artisan bread-baking course at the San Francisco Baking Institute. This was my first real exposure to bread from start to finish, and I was awestruck. Really, it was hard for me to wrap my head around some of the concepts like different levels of protein in flour yielding wildly different results, and that is what caught my eye. At this point, I was eighteen and getting ready to move to Monterey in the next year to finish my degree in business with a focus on entrepreneurship at California State University Monterey Bay. When I did move, I stayed in the realm of pastry for four more years and it wasn’t until after I graduated college that I made the jump into bread headfirst. A. When I left Konditorei in Davis, I moved to Monterey where I began working at Layers Sensational Cakes. Layers is an Italian-style pastry shop where I learned traditional Italian pastries and cookies as well as a wide array of cakes. It was my responsibility to keep the case stocked with cookies made with the owner’s mother’s recipes and build and finish cakes for wholesale orders as well as front-of-house sales. I worked at Layers for four years while I finished school, and when I graduated, I began looking at bakery jobs throughout the country in cities I had visited that I liked. This is how I found an opening at Columbia City Bakery (CCB) in Seattle. The ad said they were looking for a couple of morning bread crew team members and to send a resume and cover letter, so that’s what I did. I sent an email on a Friday afternoon to owner Evan Andres, and had a response by that evening asking when I could make the trip north to do a stage. On the day of my interview, I worked a full eight-hour shift with the A.M. crew and immediately fell in love with the process and the product. The feeling in that kitchen was like no other that I had yet experienced, everybody worked as a team to reach the goal of the highest possible quality product that we could make and I loved that. I spent close to three of the hardest years of my working life at CCB, and I feel like I made the monumental transition from baking bread to being a bread baker in this bakery. Now, I am working in Petaluma, CA as a bread baker for Della Fattoria, a local bakery and a long-time staple for Petalumans. Until now, I had only worked with convection ovens and deck ovens (with the exception of my very minimal experience with the oven at ABOW) so this has been quite a transition. The ovens we bake in are two side-by-side wood-fired brick ovens about twenty feet deep and about ten feet across. The heat in each oven is different every day depending on how much wood is added to the fire overnight as well as the outside temperature, so the bakers must adjust their practice daily depending on what the oven and the bread needs. The bread can only handle so much heat, so the bakers must take measures to manage the oven. The main way we do this is by mopping the deck early on in the bake in order to lower the temperatures slightly until the ovens mellow out (usually about an hour or two into the bake). Working with a retained-heat oven, you have to take into consideration the heat “rebound”. Once the deck is mopped, it is cool enough to put the bread in right away, but as the bread bakes, the oven floor will warm up again from the heat stored in the stone below. When you rotate the loaves in the first few ovens, you need to be extremely precise in where you place them with the peel because if you are just a few inches away from the proper spot, the bread will burn within minutes. Steam is a very important part of the bread baking process as well. It helps raise the loaf and contributes to a nice crust on the outside. Many deck ovens have a button for steam on each deck, but working on a brick oven is very different. Instead of having a steam button, we use a long hose and sprayer, reaching as far back into the oven as possible when the bread is loaded in order to steam the entire deck. It is hard work, it is sweaty work, and it is work that you absolutely need to love in order to keep doing it. 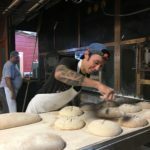 Q. Della Fattoria is more than a wood fired oven bakery, it doesn’t have a proofing room or some of the other aspects of a bread bakery – meaning it has to rely more on natural temperature outdoors. How does that change the way you make bread? A. At Della Fattoria, we try to keep our baking style as old-world as possible. This means that we do not have a proof box or a walk-in to work with on the premises. We must do our best to work with the weather and humidity each day and what it mainly comes down to is the dough temperature. The dough temp is the only thing we really have control over, so it is very important for us to achieve an appropriate temperature in each mix so that the dough does not proof too quickly and move out of control. This way, on big days, we can try to shoot for a lower temp on some mixes so that the shapers (as well as the bakers) have enough time to get through the other doughs before anything gets overproofed. If a dough is too warm, we may put it out on the back porch to cool off, and if it is too cold, we may put it next to some hot bread or next to the oven in order to make sure it is ready for us at the right time. Q. Are there bakers you admire, other kinds of bread bakeries you’d someday like to work in and any bread books that guide your thinking and inspire you? A. There are a few particular bakers I admire, mostly because of their commitment to a wholesome product made with local ingredients. 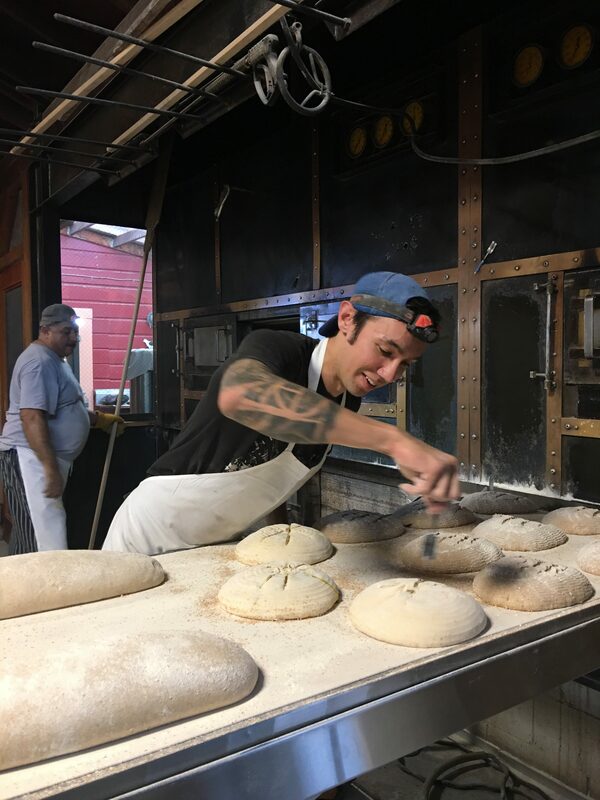 Lorin Kalisky of the Upper Crust Bakery in Davis is making a huge effort and putting a lot of his focus on sourcing ingredients from Yolo County. Kate Nycz, owner and operator of the North South Baking Co. in Cincinnati, Ohio puts an emphasis on Slow Food with local ingredients combined all by hand to produce incredible pastries and breads all by herself. A fierce one-woman wolf pack empowering and enriching her community and craft with her product. Richard Snapes, owner of The Snapery in London and co-author of Bread & Butter, is doing similar work in the UK using organic, locally produced ingredients. Sam Saulwick, co-founder of The Bread Social in New South Wales, Australia is very inspiring to me as a baker and businessperson. I read a recent interview with him where he talks about taking the time to “broker a relationship with the local farmers.” I think this is an incredibly important approach to the food industry in a globalized economy. It empowers farmers, producers, customers, and communities all at the same time. Don Guerra, owner of Barrio Bread in Tucson, Arizona, began baking bread in his garage before opening a brick and mortar store just in the last year or two under the same ethos of local, organic, and wholesome, not just pertaining to the ingredients but the people and relationships that make those ingredients possible. I have a few favorite books that I refer to on a regular basis. One of them is On Food and Cooking by Harold McGee, which is an encyclopedic cookbook. It’s a great thing to have on hand because when there is a method or product I don’t quite understand, I can usually look it up here. He provides concise explanations as well as applications for a gigantic array of products and methods. My favorite bread book is Bread by Jeffrey Hamelman. This book takes an in-depth look at every single piece of the bread making process and provides formulas and recipes for experimentation as well. And last, my newest favorite is Bread & Butter by Richard Snapes, Grant Harrington and Eve Hemingway. This book takes an anthropological stance and delves into the history of both bread and butter and how they ended up entangled in such a beautiful relationship as well as providing recipes and formulas. Q. Any advice to young aspiring bakers, as you were growing up in Davis? A. My main point of advice would be to stay hungry, never be 100% satisfied with your work. I think it’s incredibly important to understand that there is always room for improvement in whatever you do in your life. For me, every day, each loaf is different and I try to make some assessment of it, even if it’s small, there is always something to be observed and improved upon. Secondly, talk to people. If you’re interested in baking, try to get into as many bakery kitchens as possible and ask questions. People who love what they do will be eager to talk about it so long as you ask in a respectful manner. Send some emails, call some businesses, and make some contacts. It’s intimidating at first, but it feels incredible when you strike a chord with a baker or a chef in a kitchen somewhere and begin a relationship. You may decide that culinary school is the right route for you, and it may be depending on what you plan to do later on in life, but I think finding someone who is willing to take a chance on you is a very special way to learn. It’s very intense, overwhelming sometimes, but you get a feel for if you like the work or not very quickly. Conducted via email November 30, 2019, after a visit to and tour of the bakery with Casey.